I have started this thread to follow the build and decisions leading to the launch and sample return plans. 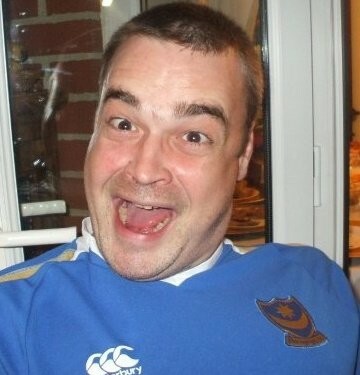 Several key articles have surfaced and I will slowly populate this over the next few weeks. Feel free to drop data in as you wish. The mission is timed for a launch opportunity in July/August 2020 when Earth and Mars are in good positions relative to each other for landing on Mars. That is, it takes less power to travel to Mars at this time, compared to other times when Earth and Mars are in different positions in their orbits. To keep mission costs and risks as low as possible, the Mars 2020 design is based on NASA's successful Mars Science Laboratory mission architecture, including its Curiosity rover and proven landing system. The primary constraint and driver for Mars 2020 development is the Project’s planned July 2020 launch date. An optimal 20-day launch window for a trip from Earth to Mars occurs every 26 months. Missing the 2020 launch window would result in significant additional costs related to overhead, stand-by work force, replacement of degraded parts and components, and storage while waiting for the next launch opportunity. Although Mars 2020 Project management has taken appropriate steps to address risks inherent in using heritage technology and several issues identified on the MSL mission, we identified several schedule-related issues that could indicate the Project is overly optimistic, including a condensed development schedule for five of the seven instruments, a shorter development timeframe than MSL, and less detailed Integrated Master Schedule for assigning timelines to all required tasks than MSL. The largest risk to the Mars 2020 schedule is the Project’s Sample and Caching Subsystem (Sampling System), which will collect core samples of Martian rocks and soil and place them on the planet’s surface for retrieval by a future robotic or human mission. At Preliminary Design Review (PDR), three of the Sampling System’s critical technologies were below technology readiness level (TRL) 6, meaning the prototype had not yet demonstrated the capability to perform all the functions required. Projects are evaluated during PDR to ensure they meet all system requirements with acceptable risk WHY WE PERFORMED THIS AUDIT WHAT WE FOUND and within cost and schedule constraints. 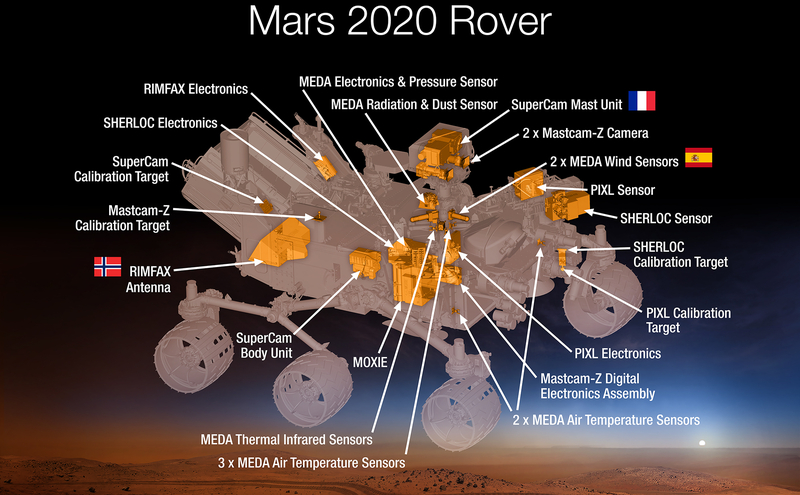 The immaturity of the critical technologies related to the Sampling System is concerning because, according to Mars 2020 Project managers, the Sampling System is the rover’s most complex new development component with delays likely to eat into the Project’s schedule reserve and, in the worst case scenario, could delay launch. As of December 2016, the Project was tracking the risk that the Sampling System may not be ready for integration and testing – the period when a spacecraft is built, undergoes final testing, and is prepared for launch – in May 2019, as planned. The Mars 2020 Project also does not appear to be on track to meet the 90 percent metric for release of engineering drawings by the February 2017 Critical Design Review (when a project demonstrates its design is sufficiently mature to proceed to full-scale fabrication, assembly, integration, and testing). Engineering drawings communicate to manufacturers the details of a product’s design and are considered a good measure of a project’s stability. Failure to achieve this metric could affect the Project’s ability to ensure design stability, achieve technical objectives, and meet schedule and cost expectations. The six-wheeled robot, similar in appearance and capability to NASA’s Curiosity rover currently on Mars, will look for signs of past Martian life, assess the habitability of the environment, and measure the chemical, mineral and organic make-up of rocks, with an emphasis on hunting for biosignatures, the natural relics left behind by alien microbes. Its other chief objectives will be to collect at least 30 test tube-sized core samples for possible retrieval and return to Earth on a future mission, and test a new device to generate oxygen from carbon dioxide in the Martian atmosphere, validating a tool future missions could employ to produce breathable air, water and rocket fuel. Scientists met last week in California to narrow a list of eight potential destinations selected in 2015. Acting on the advice of the 172 researchers, NASA settled on three finalists Saturday, setting the stage for a final decision by top agency managers in 2018 or 2019. The robotic mission, officially named Mars 2020 for now, will launch in July 2020 aboard a United Launch Alliance Atlas 5 rocket and reach the red planet in February 2021, descending through the atmosphere with the assistance of a heat shield, parachutes and braking rockets before cables unreel to place the rover on the surface. The “sky crane” descent system is based on the technology demonstrated with the landing of Curiosity on Mars in August 2012. 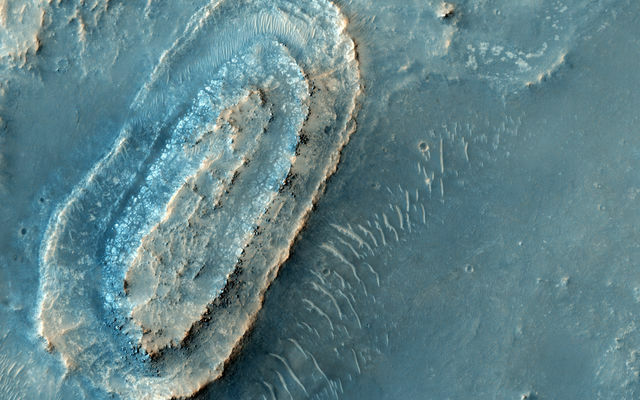 The shortlist of landing sites includes the Columbia Hills, a range of heights in 4-billion-year-old Gusev Crater where NASA’s Spirit rover landed in January 2004. 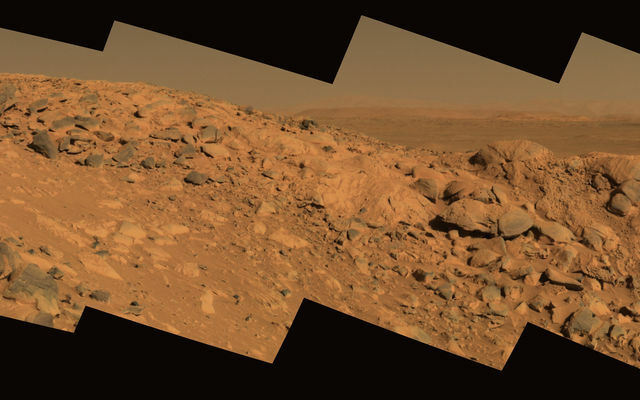 Spirit found evidence that the region had a watery past after climbing from its touchdown point in the basin of Gusev Crater into rounded highlands named for the astronauts who died aboard the shuttle Columbia. The rover drove 4.8 miles (7.7 kilometers) during its mission, and kept going after one of its wheels stopped turning. The inoperable right-front wheel dragged up white soil — the rover’s spectrometer determined the material was nearly pure silica — and scientists linked the unexpected discovery with the presence of ancient hot springs and steam vents. Such an environment could have hosted microbes billions of years ago, making it an ideal location to land the Mars 2020 rover, scientists said. Spirit reached a feature named “Home Plate,” the remnant of a hydrovolcanic explosion involving three key ingredients for life: heat, energy and water. The Spirit rover, which functioned 25 times longer than its 90-day design life, also found outcrops of carbonate in the Columbia Hills, deposits which scientists say were emplaced during a wetter period of Martian history. Data gathered by Spirit also indicate Gusev Crater could have periodically flooded and made shallow lakes. Proponents of the Columbia Hills site also tout the possibility of sending the Mars 2020 rover to inspect Spirit where it bogged down in a sand pit in 2009 and likely froze its internal electronics during a frigid Martian winter. NASA last heard from Spirit in March 2010 and gave up on recovering the mission in May 2011. At the third landing site workshop for the Mars 2020 mission on Feb. 8-10, 2017, a team of scientists narrowed down the list of potential places where NASA's Mars 2020 rover may land. Mineral springs once burbled up from the rocks of Columbia Hills. 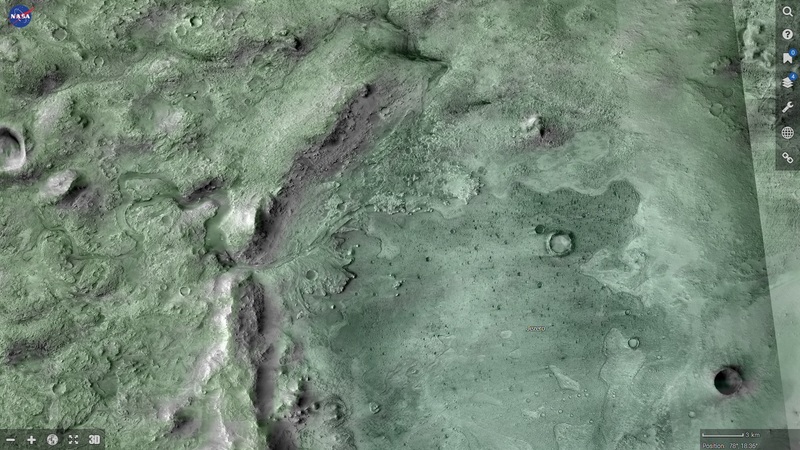 The discovery that hot springs flowed here was a major achievement of the Mars Exploration Rover, Spirit. The rover's discovery was an especially welcome surprise because Spirit had not found signs of water anywhere else in the100-mile (160-kilometer)-wide Gusev Crater. 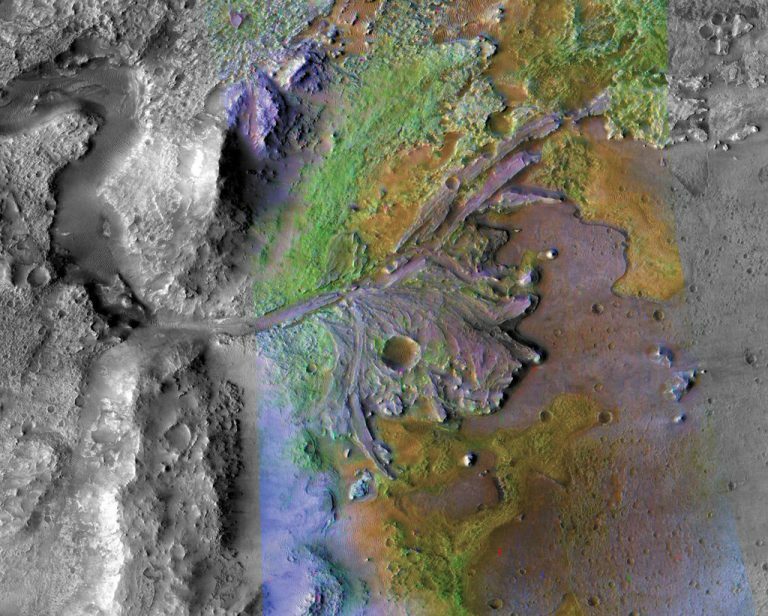 After the rover stopped working in 2010, studies of its older data records showed evidence that past floods that may have formed a shallow lake in Gusev. 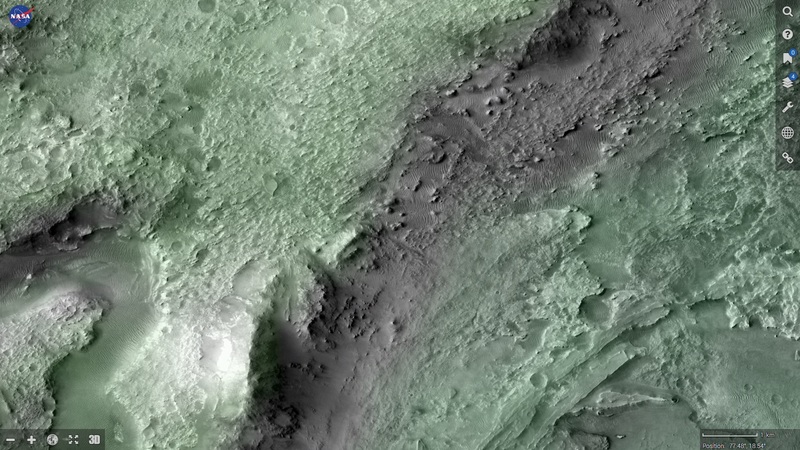 Jezero Crater tells a story of the on-again, off-again nature of the wet past of Mars. Water filled and drained away from the crater on at least two occasions. More than 3.5 billion years ago, river channels spilled over the crater wall and created a lake. Scientists see evidence that water carried clay minerals from the surrounding area into the crater after the lake dried up. Conceivably, microbial life could have lived in Jezero during one or more of these wet times. If so, signs of their remains might be found in lakebed sediments. Volcanic activity once warmed NE Syrtis. Underground heat sources made hot springs flow and surface ice melt. Microbes could have flourished here in liquid water that was in contact with minerals. 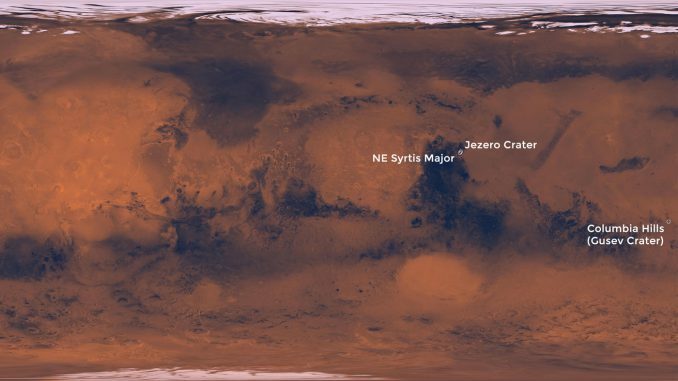 The layered terrain of NE Syrtis holds a rich record of the interactions that occurred between water and minerals over successive periods of early Mars history. obviously far to early to think about but would this ideal for a falcon heavy or will be it be too heavy for that? Napkin math says Falcon Heavy could transport a few of these things to Mars. The only issue would be the fairing space. NASA’s Mars 2020 Rover: Stepping Stone to What? MONROVIA, Calif .— NASA’s next major interplanetary mission is the Mars 2020 rover. The robot explorer is expected to touch down on the Red Planet in February 2021, but there is one key detail that remains to be decided: Where exactly it will land. Wherever the rover finds itself in 2021 will likely shape the future of Mars exploration for decades to come. Besides poking around its landing site for signs of past habitability and Martian life, the rover will also select and cache samples for an eventual return to Earth at some yet-to-be-determined date. Once gathered, the precious samples will unquestionably beckon us back to Mars, even if no one yet knows what secrets they shall hold or whether humans or robots will retrieve them. Twice before, mission planners have gathered to winnow their overlong list of candidate landing sites, each time emerging with a smaller number of high-priority places to go. From February 8 to 10 some 250 planetary scientists and spacecraft engineers gathered here for their third confab—the penultimate meeting before Mars 2020’s final landing site is chosen. A fourth workshop to ruminate further about the remaining candidate sites is slated for early to mid-2018, after which NASA’s leadership will pick the rover’s final destination. Computer artwork of Mars 2020 rover with outstretched robotic arm. From an engineering perspective, the Mars 2020 mission is very much a mirror image of the Curiosity robot that has been busily working on the planet since August 2012. Getting this next rover down and dirty on Mars utilizes the same entry, descent and landing approach—a nail-biting plunge through the atmosphere cheerily known as “seven minutes of terror” that culminates with a “sky crane” firing retro-rockets and hovering over the surface as it carefully lowers the rover onto Mars. This time, however, the Mars 2020 hardware will possess new systems to attain a more precise landing spot and to make last-minute maneuvers to avoid hazardous boulders, slopes and sand traps. Moreover, once grounded the rover will operate with more autonomy compared with Curiosity, thanks to a batch of software upgrades. Jennifer Trosper, system engineering lead for the rover at Jet Propulsion Laboratory (JPL), says those improvements can assure no dillydallying on Mars. Enhanced navigation across all kinds of complex terrain means Mars 2020 can get its primary scientific chores done far more efficiently and quickly than Curiosity ever could, Trosper says. Indeed, the rover must perform its tasks significantly better relative to Curiosity to achieve its mission objectives, she says. A keystone goal for the nuclear-powered Mars 2020 rover will be to rigorously document, then gather and stash an “astrobiologically relevant” cache of Martian samples for future transport back to Earth. “Mars 2020 is not a life- detection mission, but I think targeted to the right place we can make great strides toward finally answering the question about life on Mars. It gets us down the road” to find out, says John Grant, a geologist at the Smithsonian Air and Space Museum’s who co-chairs of the Mars 2020 Landing Site Steering Committee. NASA's past landing sites on Mars (yellow) versus the three proposed landing sites (red) for the Mars 2020 rover. Analysis of the candidate sites comes courtesy of NASA's Mars Reconnaissance Orbiter (MRO), in orbit around the Red Planet since 2006. With its 0.5-meter aperture HiRISE camera, MRO gives NASA the equivalent of spy satellite resolution from low orbit. The spacecraft has been circling Mars long enough to see changes in sites over the past decade. MRO will have passed along an amazing 300 terabits of information this year, more than every other interplanetary mission combined. 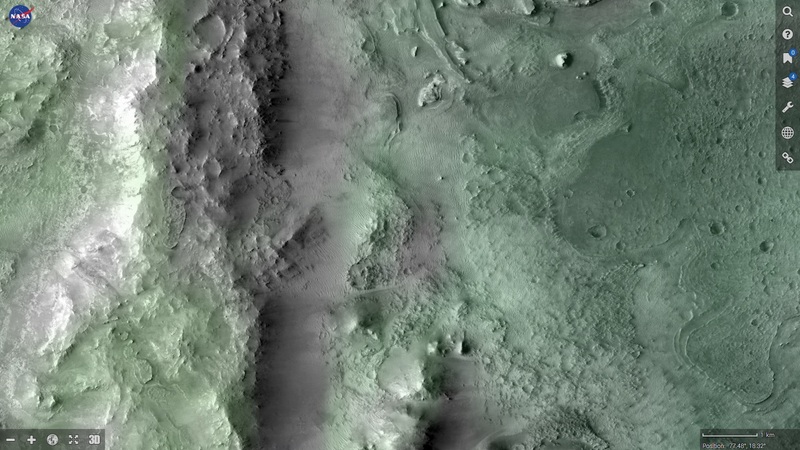 MRO has mapped 99% of the surface of Mars down to a resolution of 25 meters or better, including high-resolution swaths over selected sites down to better than a meter resolution. Data collected from MRO will also be incorporated during eventual site selection for crewed missions to Mars in the 2030s. The Mars 2020 rover resembles Curiosity on the exterior, and like its younger sibling, the Mars 2020 rover will land via sky crane and sport a plutonium-fueled nuclear Radioisotope Thermoelectric Generator (RTG). However, the Mars 2020 rover will use a range trigger during the Entry, Descent and Landing (EDL) phase, which will allow the lander to decide when to open the parachute, reducing the size of the landing ellipse. Also unlike Curiosity, the Mars 2020 science packages will directly target the question of whether life ever existed on Mars. Moreover, Mars 2020 rover will carry 40 empty tubes for rock cores, with the aim of collecting a cache of surface material for a possible automated sample return mission in the future. "We can choose a final landing site as late as one year prior to launch," says Williford. "But our goal is to have site selection finalized by two years prior to launch." Mars 2020 will launch on an Atlas 5 rocket in July 2020 from Cape Canaveral. It should arrive at Mars in early 2021. 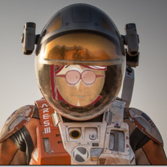 If all goes as planned, humanity will really start to invade Mars in the next two launch windows. Only one mission, the European Space Agency (ESA) ExoMars Trace Gas Orbiter and ill-fated Schiaparelli Lander made the trip to Mars in 2016. With Mars launch windows coming around about every 26 months, the next one will arrive in 2018. Watch for NASA's Mars InSight and possibly SpaceX's Red Dragon lander to make the trip then. All four potential landing sites for Mars InSight are within a landing ellipse in Elysium Planitia. The 2020 mission roll call is far larger, and should include the Mars 2020 rover (it'll have a proper name like every other NASA rover by then), the United Arab Emirates' Mars Hope orbiter, a possible rover fielded by China, ESA's ExoMars rover, and India's second Mars mission. Get ready as Mars exploration kicks into high gear. The future of NASA's Mars programme is taking shape. The agency has narrowed — from eight to three — the list of potential landing sites for its 2020 rover, which will scoop up Martian rock and soil in the hope of one day returning them to Earth. NASA shortlisted the sites on 10 February, at the end of a three-day workshop in Monrovia, California to hash out where the spacecraft will go. The final decision, due a year or two before launch, will be one of the most momentous in Mars exploration. The rocks that the Mars 2020 rover collects are likely to dictate the scientific questions that will be tested for decades to come. “What if this is the only set of samples that we ever return from a known place on Mars?” asks Briony Horgan, a planetary scientist at Purdue University in West Lafayette, Indiana. Until now, the only Mars rocks that researchers have studied are meteorites, which reach Earth stripped of their original geological context. 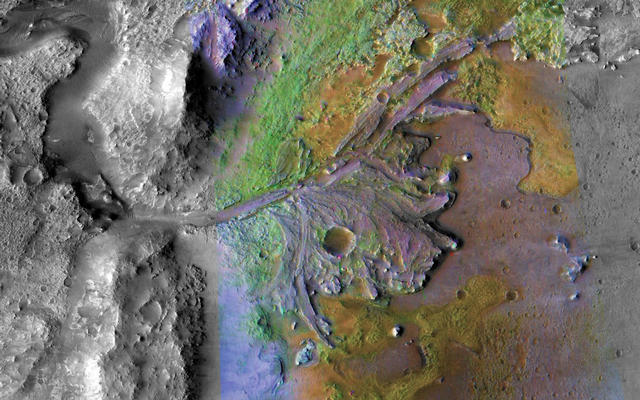 The three landing sites still in contention include Jezero crater, which was once home to an ancient Martian lake and which could preserve the remains of microbial life, if that ever existed on Mars. “You've got a large river bringing water and sediment into a very large lake, comparable to Lake Tahoe,” says Timothy Goudge, a planetary scientist at the University of Texas at Austin. Jezero scored highest on a community vote of scientists attending the workshop. Other possible targets are Northeast Syrtis, where hot waters once circulated through the crust and could have supported life, and Columbia Hills, the area explored for years by NASA's Spirit rover. Also out of the running is Eberswalde crater, which scored third in the community vote but is also far south and gets quite hot, Golombek says. Jezero crater offers the same sort of ancient-lake environment without the risk posed by high temperatures, he argues. 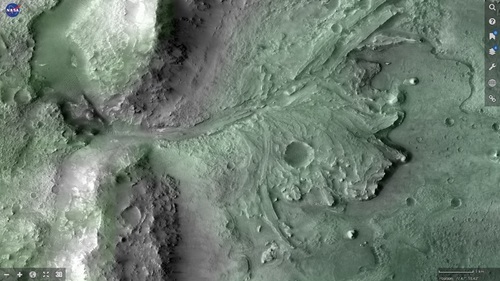 And the community’s fourth choice of Mawrth Vallis, although rich in clays, is not as clearly connected to a possibly once habitable environment, he says. NASA has neither designed nor budgeted for how to get the Martian rock samples back to Earth. So the 2020 rover will drill and collect the samples, then lay them down on the Martian surface for an as-yet-unplanned mission to retrieve. The European Space Agency is launching its own Mars rover in 2020, to Oxia Planum. China also plans to send one that year, when the alignments of Earth and Mars are favourable for launching missions between the two. I've got my hopes up for the Jezero region, on or near where the river let out to form the delta. I'd certainly put it at the top of the list for a manned mission. It's a Geologists' "gold mine", and offers good climate to boot. Nice and warm there. Plus there are cliffsides as well as soft regolith nearby to dig into when it's needed to satisfy the NASA people who are dead-set on being able to have the below-ground Solar Flare Shelter. That area is prime real estate, to my thinking. Only worrying constraint is whether the regolith is too soft to support a heavy lander and the habs there, since it is a riverbank and an old flood plain. Don't need our gear sinking into the dust or tipping over. My own contrasted images of the Jezero Crater Delta, and the settings used in Mars Trek. Elevation -9000 -ish, Nil Fossae Region. Right on the edge of Isidis Planitia, where they found that big subsurface ice deposit -- enough to fill Lake Superior 1.5+ times over. Yes, there. Bout 250-ish kilometers southwest of that. It's interesting, but I'm noticing that Martian soil has a particular look to it when it is "ice-laden" compared to when it's "dry". I can't be the only one seeing it. The ice-laden soil tends to be darker to some degree depending on how much moisture is there. That might be an indicator of where to look for ice/water, it might not. Worth taking a look, maybe? Please enjoy these. I know I did when I took the screen shots from Mars Trek. Quite a piece of handiwork, bringing out the contrast like this if I say so myself. I'll be happy to share the settings, it wasn't that difficult but it did involve some trial and error like with the Brown Dwarf I imaged last year using Keck. Just about 24 hours, let's see if it'll let me share them. And there we go. Not much to it, but as I said some trial and error involved to really bring the contrast out. And take a gander at the dune action! As the late Steve Irwin would say ... "what beauties!" The images really are worth zooming in on ... I took care to make sure there was as little loss as possible when converting to .jpeg. I hate lossy images. Should NASA's Next Mars Rover Tread New Ground? Composite artwork depicts meeting of Mars machinery: The Mars 2020 rover wheels up to the Spirit rover in the Columbia Hills. The search for Martian life may take NASA's next Red Planet rover to a site already explored by one of its smaller cousins. Columbia Hills/Gusev Crater, which NASA's now-dead Spirit rover studied intensively from 2004 through 2009, is one of three finalist landing sites for the agency's next Mars rover, a life-hunting machine scheduled to launch in 2020. "Because NASA's stated objective for the 2020 rover is to seek signs of past microbial life, the fact that we can point to possible signs of microbial life among rocks in the Columbia Hills is a major reason to go back," said Steven Ruff, associate research professor at Arizona State University's Mars Space Flight Facility in Tempe, Arizona. 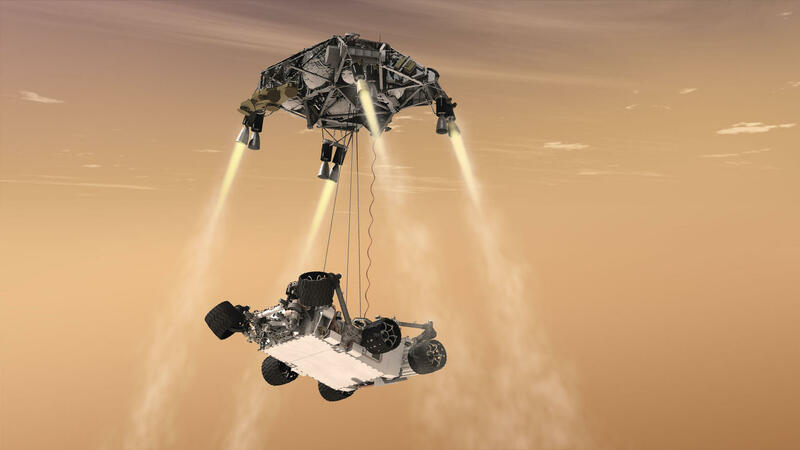 NASA's Mars 2020 rover mission will use the "sky crane" system that landed the agency's Curiosity rover on the Red Planet in August 2012. "We know from a range of observations by Spirit that the rocks it found next to Home Plate, the ones composed of opaline silica, most likely formed in hot-spring discharge channels," Ruff told Space.com. "The remarkable similarities in their shapes, textures and mineralogy with silica rocks we found among hot springs at El Tatio, Chile, make the case." Ruff pointed to samples picked up at El Tatio as being formed from a combination of biology and geology, so the possibility exists that Martian silica rocks formed the same way. "We should go find out," Ruff said, referring to Mars 2020's destination. Another Mars 2020 landing-site workshop will be held next year. That get-together will further hone down the sites, but the final call falls to NASA headquarters. 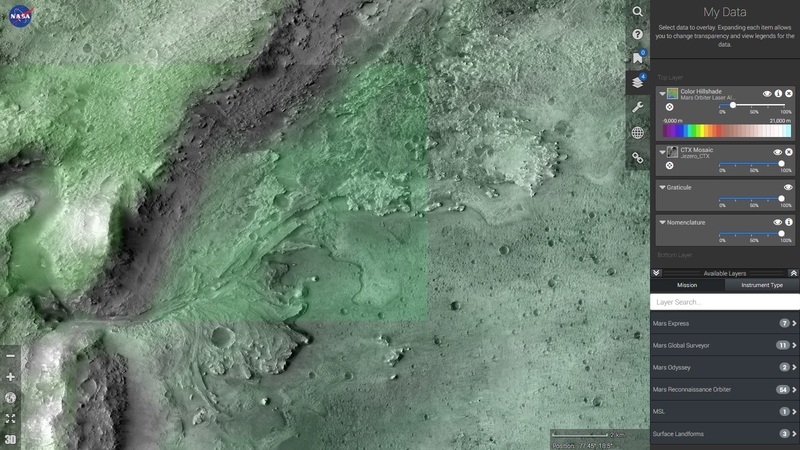 For the most part, the 2020 rover will follow the landing playbook used by NASA's Mars rover Curiosity, which touched down inside Gale Crater in August 2012 and is currently exploring the foothills of the 3.4-mile-high (5.5 kilometers) Mount Sharp. The 2020 Mars rover will experience the same "7 minutes of terror" entry, descent and landing scenario, which ends with the use of a rocket-powered sky crane lowering the rover onto Mars terrain. 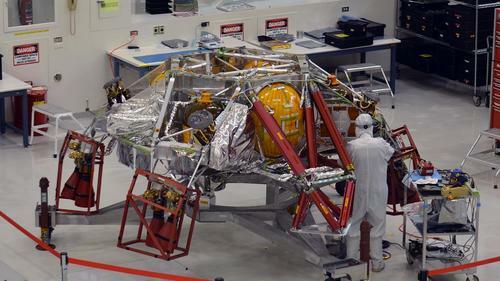 But the new rover features some updates that will make its landing special, said Allen Chen, entry, descent and landing lead for Mars 2020 at NASA's Jet Propulsion Laboratory in Pasadena, California. Two new techniques — Range Trigger and Terrain-Relative Navigation —make it feasible to shrink the rover's landing ellipse considerably, compared to previous Mars landers, Chen said. Those new abilities allow the rover to "get close to the fun stuff" that scientists are hungry for, Chen told Space.com. Terrain-Relative Navigation will allow the 2020 rover to avoid rough terrain, sharp slopes and other perils, while Chen said that Range Trigger permits precise timing of parachute release. Onboard software will autodecide if the rover's parachute is to be deployed early or late, given how close the robot might be to its desired touchdown target, Chen said..
Mars 2020 and Curiosity also have different mission goals. Curiosity is tasked primarily with determining whether or not Gale Crater has ever been capable of supporting microbial life — a question the rover answered in the affirmative early in its mission. But Mars 2020 will actually hunt for signs of past life. The 2020 rover will drill and cache the most compelling astrobiological samples at the selected site for later pickup and return to Earth. Once transported back to our home world, specimens would be subject to the best scientific scrutiny that researchers can muster, given a bevy of powerful and innovative lab tools. Artwork depicts NASA's Mars 2020 rover, geared to hunt and cache select samples that may provide clues to past and present life on the Red Planet for eventual return to Earth. The 2020 rover isn't the only craft being prepped for a trip to Mars in the near future. NASA aims to launch a lander called InSight next year, to investigate the Red Planet's interior structure. The life-hunting ExoMars rover, a joint effort of the European Space Agency and Russia's space agency, is scheduled to lift off in 2021, and China plans to launch its own Mars rover in that same general time frame. And then there's SpaceX. Elon Musk's company intends to launch its uncrewed Dragon capsule toward Mars in 2020, with follow-up missions occurring every two years or so thereafter. Crewed missions aboard the company's Interplanetary Transport System could begin sometime in the 2020s as well. The first planned ATLO activities will involve electrical integration of flight hardware into the mission’s descent stage. The Mars 2020 rover, as well as its cruise stage, aeroshell and descent stage -- a rocket-powered "sky crane" that will lower the rover to the planet's surface -- will undergo final assembly at the Spacecraft Assembly Facility High Bay 1 at NASA’s Jet Propulsion Laboratory in Pasadena, California. NASA is prepared to announce which of four final contenders it has selected as the landing site for its Mars 2020 rover, which is due to touch down on the Red Planet in 2021, and we'll all find out more on Monday (Nov. 19). 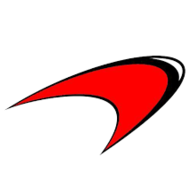 The agency will announce its choice in a news teleconference Monday at 12 p.m. EST (1700 GMT). Audio and visuals from the announcement will be available to watch here on Space.com, courtesy of NASA TV, or directly at the agency's website. Jezero is also on SpaceX's short list. Since the Wright brothers first took to the skies of Kill Devil Hills, North Carolina, Dec. 17, 1903, first flights have been important milestones in the life of any vehicle designed for air travel. After all, it's one thing to design an aircraft and make it fly on paper — or computer. It is quite another to put all the pieces together and watch them get off the ground. The majority of the testing the flight model is going through had to do with demonstrating how it can operate on Mars, including how it performs at Mars-like temperatures. Can the helicopter survive — and function — in cold temperatures, including nights with temperatures as low as minus 130 degrees Fahrenheit (minus 90 degrees Celsius)? All this testing is geared towards February 2021, when the helicopter will reach the surface of the Red Planet, firmly nestled under the belly of the Mars 2020 rover. A few months later, it will be deployed and test flights (up to 90 seconds long) will begin — the first from the surface of another world.